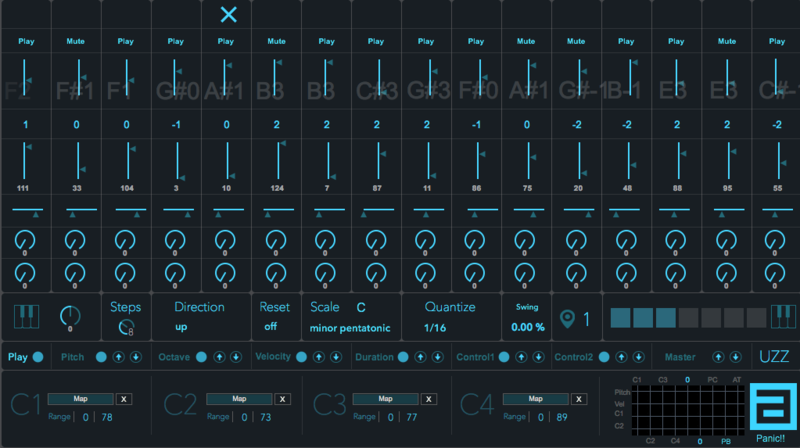 UZZ is a Max For Live device inspired in the step sequencer created by Len Sasso for Logic Audio environment. - Mode: Play/Mute. - Pitch: Range 0-12. - Octave: -2 to +2, five eights. - Velocity: Range 0 – 127. - Duration: Range 2 – 1000ms. - Two remote controls (control 1 and 2): 0 – 127. - Keyboard icon activates midi notes input that will be affected by Transpose. - Double click on Keyboard icon resets the transpose 0. - Transpose: Transposes the sequence: -24 to 24. - Steps: Selects the number of steps: 1 – 16. - Direction: Direction of the sequence: forward, backward. forward & backward. - Reset: Reset the sequence to global clock of the song. - Scale: Scale Select the type of scale (up to 19 different scales). - Quantize: Quantize: Quantizes the sequence: 1/2, 1/4, 1/8,1/16, 1/32, Dotted and Triplets. - Swing: Swing on/off, and Swing amount. - Preset Map:You can map the preset change from your controller in number box, but you must enable it before with the map icon. - Preset:To record shift + click a grey square; to recall the preset click on it. - Keyboard icon enable for recall presets from input notes (C6 to B6). - A double click deletes all presets. Caution!!!! Global Parameter Tweak: - Press the parameter name to reset it. - All parameters have a random button. - Roll up and down the parameters with the arrows. - Modulate any parameter with Pitch, Velocity, Controls 1 and 2. 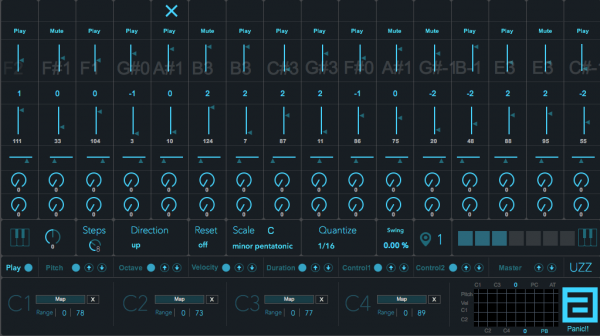 - C1, C2, C3, C4, four controls to map any parameter in Ableton. - Click on map button; then, click any Ableton control to map; to unmap, click the *X* button. - Modulate any parameter with Pitch, Velocity, Controls 1 and 2. - Send a note off to all notes.